Symptom: Sound in one channel stops working after 20 minutes of use. I have worked on this jukebox in the past for other reasons; it gets a lot of daily use. When I first arrived, I couldn’t find anything wrong. I could hear sound coming out of each speaker. I checked all of the connections. We were on the fourth or fifth record, and I was about ready to leave, when it stopped working. It started with static sounds, then after about a minute, the sound was totally gone. After further checking of connections, I learned it was sensitive to vibration. I could tap the final stage of the power amp with the handle of my screwdriver and the problem would change in severity, but wouldn’t begin working completely. My initial thought was there was a bad connection in the socket for one of the power transistors. I brought the amp back to my home shop and removed each power transistor and replaced the mica insulators and cleaned the pin contacts. I also ordered and replaced the larger electrolytic capacitors in the power supply circuit and the final power amp circuit. Electrolytic capacitors gradually lose their capacitance with age. I assume this is because the electrolyte paste eventually dries out. In some cases, especially in high voltage vacuum tube amps, the paste will leak out and the capacitor eventually shorts out. This amp is over 50 years old, and although the capacitors seemed fine, it’s just a matter of time. However, after rebuilding the amp, the original problem still existed. I isolated the problem to Q15. This transistor drives the transformer that phases the final output stage drivers. As a double check, I swapped the channel “A” Q15 with the channel “B” Q15, and the problem moved to the other channel. I don’t know why it’s sensitive to vibration, but there must be a problem with an internal connection inside the transistor case. In any case, it needed to be replaced. 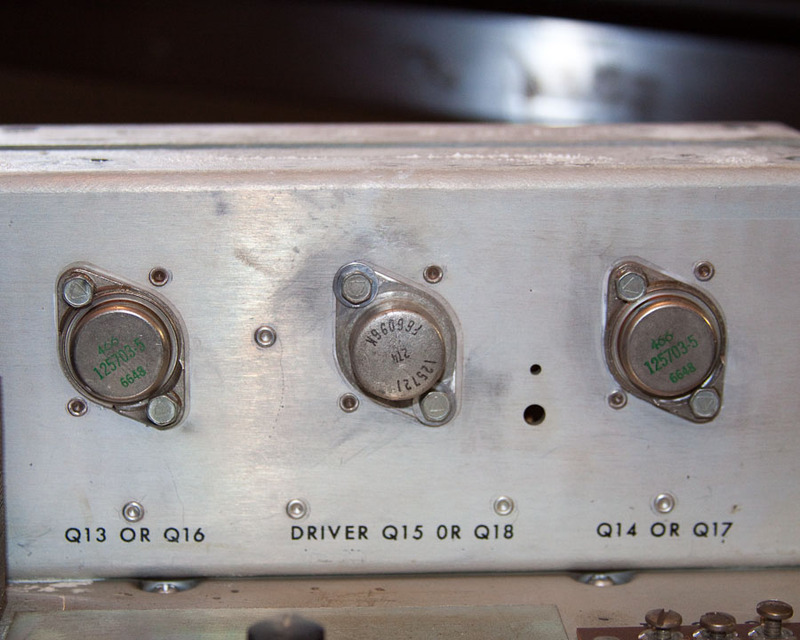 One of the difficulties working on solid state Wurlitzer amplifiers is that Wurlitzer used their own part numbers for transistors, probably even specifying to the manufacturer to print their part number on the case. Power amplifier stage for channel "B" showing transistors with Wurlitzer part numbers. Note the 6648 number, which is the date code: manufactured the 48 week of 1966. It’s difficult to figure out what the transistor is and to find a suitable replacement. Fortunately, with some help from Google and Bing, I found out this same transistor (Wurlitzer part number 125721) is also used in their electric organs. Somebody figured out it matches an NTE121, Germanium PNP Transistor, Audio Frequency Power Amplifier. I was surprised to find that somebody was still making germanium transistors. (99.9% are made from silicon.) Keep in mind that the forward bias voltage on a germanium transistor is 0.1V, compared to silicon forward bias of 0.6V. This is something I had forgotten. The replacement part was ordered and the amp is now working fabulously. Symptoms: Would not trip at end of record. When selecting B7, it would also play D7 and vice versa. Checked the switch continuity with an ohm-meter and the switch was not reliable. Since the prospect of getting a duplicate switch was slim, I opted to open it up and clean the contacts. It solved that problem. Observing the selector pins under the mechanism while the owner pressed the selector buttons on the front of the jukebox, I could see that two solenoids were activating at the same time. With an ohm-meter, I verified that the B and D solenoids were shorted together. I unplugged the front selector switches and the short was still present. I removed the selector mech and realized the box attached to the bottom of the selector mech was the stepper unit for remote boxes. I unplugged the stepper unit from the selector mech and the short between the solenoids went away. The problem was one of the stepper relays was gummed up with old grease and wasn’t resetting to zero. It was stuck between B and D, shorting them out. After consulting with the owner, I manually moved the stepper to the reset position, not repairing it and leaving it gummed up. The owner was never going to use the stepper unit, and I couldn’t simply leave the stepper unplugged because, according to the service manual, there needed to be a jumper plug installed. I replaced the needle, which improved the sound substantially.